Don't you hate those awkward conversations you have to have once in a while when you are stuck for what feels like an eternity? Say, for example, you are waiting for your son to be released from school, and your good friend sends her husband to school. You've met the guy a few times but you don't really know him, and now you're stuck for 6 minutes staring at a closed classroom door struggling for things to say. How 'bout them Dodgers? And the weather's nice, eh? Don't think I'm being awkward, but how about that weather? I don't know what it's like for you right now, but lately my little corner of Southern California is not acting at all like Southern California. We are supposed to get 4 inches of rain over the winter, and then a couple months of glorious days in the 70s and 80s and then a hot summer. In precisely that order. We don't flip flop between seasons. We don't go back to rainy days after they are done and spring has come. But these days the weather is acting like... like... like the midwest. I love the midwest, I do. Despite growing up in Sunny paradise here, most of my childhood memories (and certainly my best memories) are from my summers in Green Bay. It's just that since small neighborhood houses here sell for close to a million dollars, you ought to get sunshine with your mortgage payment. Every day. The past month had been kooky. One day it's raining, the next it's sunny and hot. Then back to overcast and cold. We even had... ugh... humidity. One Friday I was running, with my hood up, through the pouring rain to my daughter's classroom. The next Friday, at the exact same time, I was walking there in a sundress, trying to find ways to distract myself and stay in the sunshine for just a few seconds longer. Lazy days at the pool mean snacks and drinks and more snacks. Those kids parents can work up an appetite while they swim watch people swim! 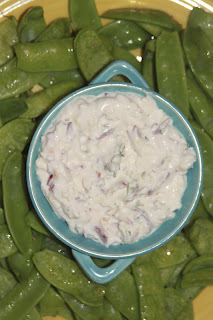 I found this recipe for radish dip in Martha Stewart Magazine this month. It's yummy and easy to throw together. 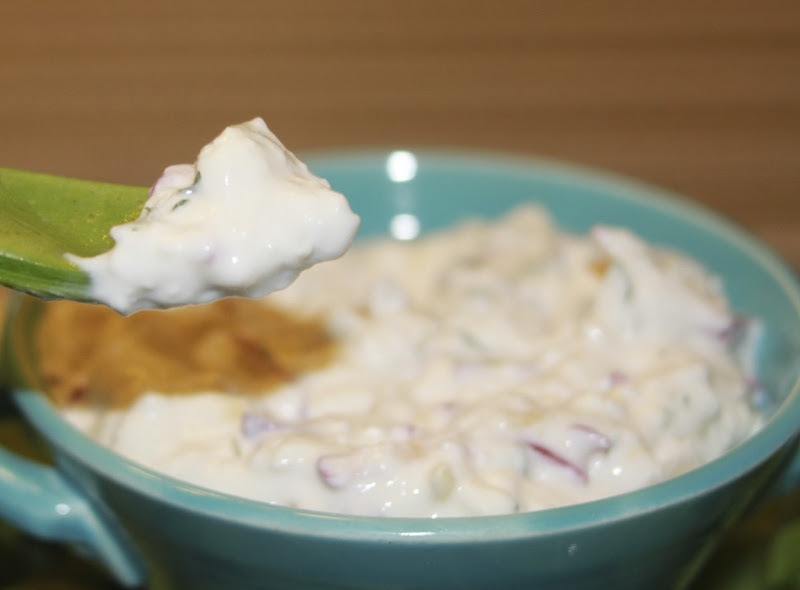 It tastes even better the day after you make it (when the ingredients have had time to meld). 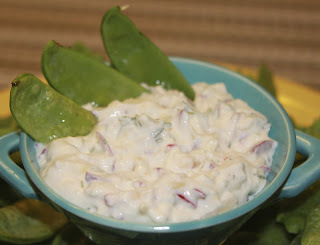 Stir together a batch of dip, and then bring it along with some pita chips or baguette slices to your picnic. Or pool day. Or happy hour party (It's fancy enough for that if you want it to be!). Or, skip the carbs and serve it with fresh snap peas and carrot sticks. After all, you want to look good poolside! Martha's recipe makes enough to serve quite a crowd. I cut everything in half and still had plenty. Combine all the ingredients and chill until ready to serve.